I Love Las Vegas Magazine...BLOG: National Burger Day Is Coming! Where To Celebrate? 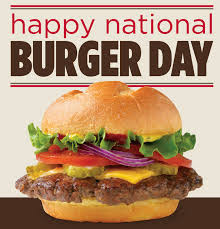 National Burger Day Is Coming! Where To Celebrate? Celebrate with the popular “The Cure Burger” featuring a ground beef and pork blend, stuffed with fontina cheese and topped soy marinated onions, jalapeno jelly, lettuce, tomato, spicy mayo, and parsnips on a brioche bun or use it or bleus it with the mouthwatering “Black & Bleu Burger” with a fresh grilled ground chuck patty with bleu cheese, caramelized onions and bacon served on a toasted brioche bun with house-made parmesan horseradish cream sauce. Guests will enjoy a wide variety of burgers designed to please the pickiest of palettes. Vegetarian options and build-your-own burgers are also available. Free burgers are only available on Saturday, May 28, 2016 from 11 a.m. – 6 p.m. Dine in only and limit of one burger per qualifying customer. Tax and gratuity are not included. Management reserves all rights and approval on name variations to qualify. Not valid on double burgers or build-your-own burgers with more than three toppings.